Jill is joined by special guest Brenda Castiel! You can find Brenda's patterns on Ravelry, follow her on Instagram at bcastiel, or check out her etsy shop, Good Stuff Crafts. Brenda finished a sweater for her 4-year-old grandson with a colorwork yoke with the stranding on the outside. Her Rav page is here. She also finished a pair of socks. Jill finally finished her Sizzle Pop by Lesley Anne Robinson! Her Rav page here. She used Hula Hut Tiki Sock in Huckleberry Chuckle and Midnight. 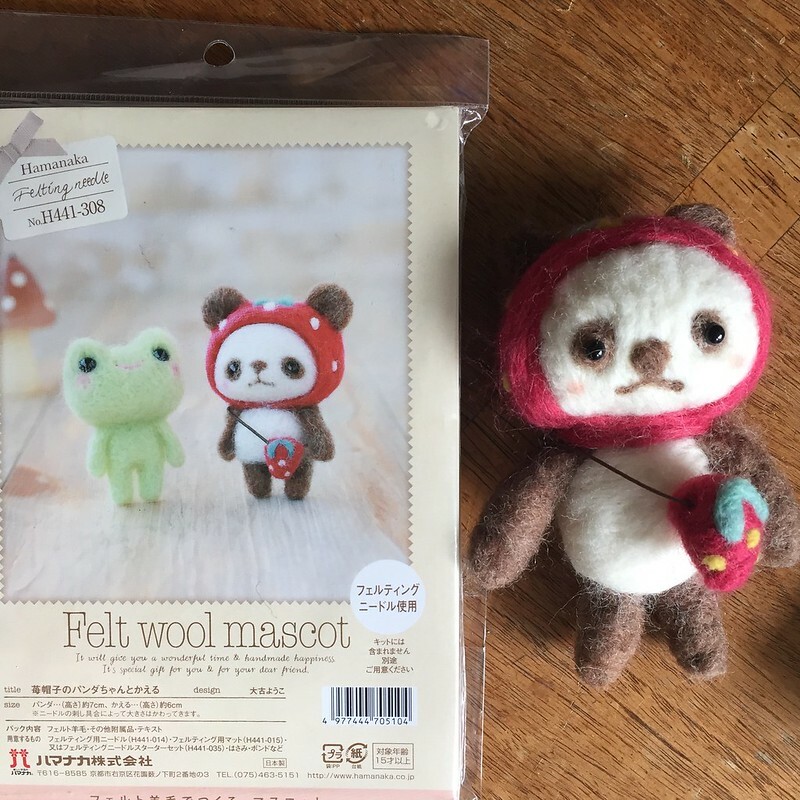 She plyed her singles spun from Mork Made Fiber Co. She also needle felted a little bear for her Mom for Mother's Day out of a kit from Hamanaka, purchased at Tokyu Hands. Brenda is working on a pair of socks out of Regia Pairfect. She also has a shawl design in progress using Sweet Georgia yarns. Her Rav page here. She has some languishing WIPs including a second Richmond Mitt in YOTH yarns and a Hitofude cardigan in Wollmeise. Jill is struggling with her Tiong Bahru by Asa Tricosa in Blue Moon Fiber Arts Marine Silk Lace in Every Day Grey. She has been getting some knitting done on True Friend by Veera Valimaki out of Dream in Color Jilly in Brilliant and Madtosh Merino Light in Silver. 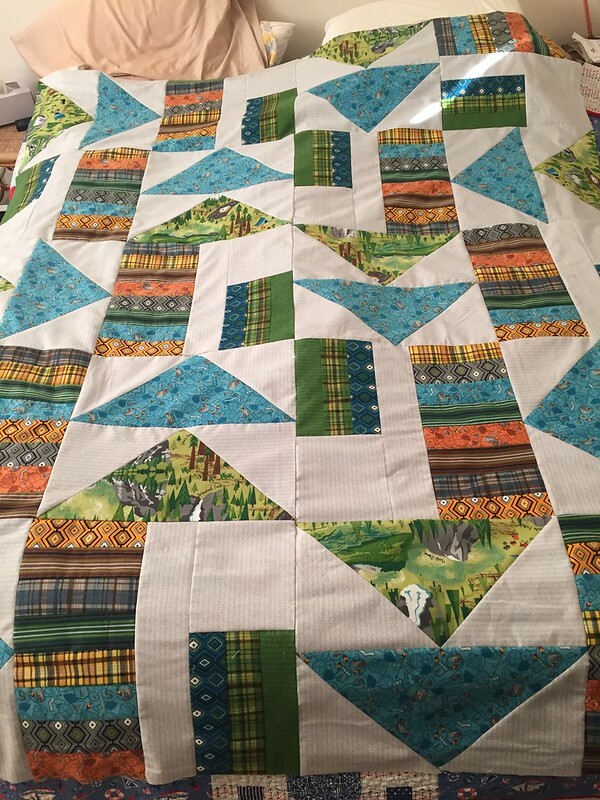 She finished the piecing of her Rugged Trail quilt by Connecting Threads using Yosemite Park Flannel. 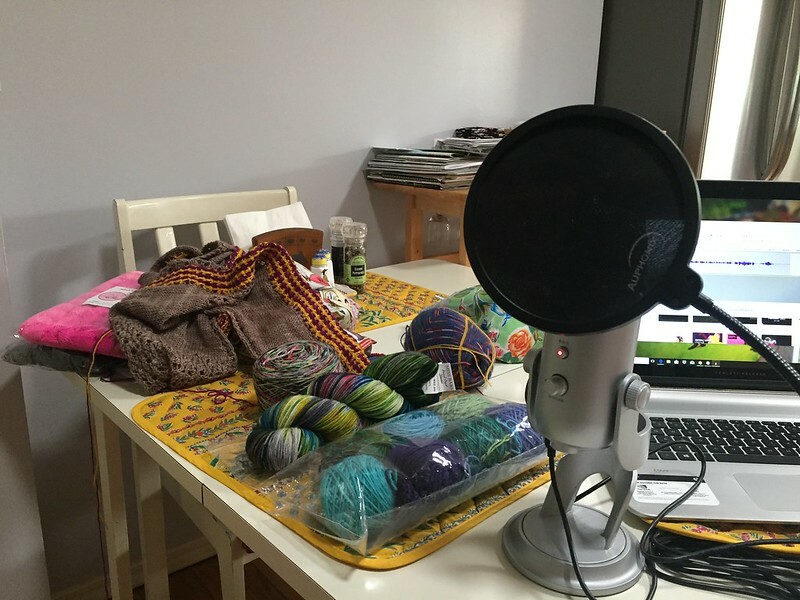 Jill watched a Craftsy class, Piece Like a Pro by Donna Lynn Thomas and found it very helpful. Brenda has a few design projects she's excited to get started on. One is going to involve a gradient set of Dragonfly Fibers Traveller in Blurple. She is debating using a Miss Babs yarn as the contrast, or Suburban Stitcher in Rainbowalong 2017. 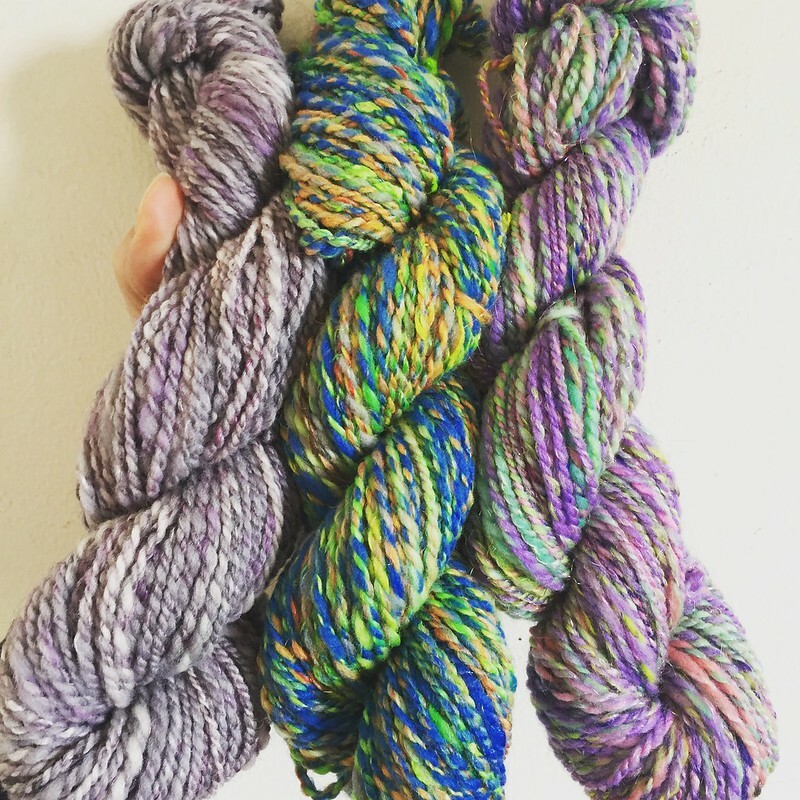 She also received a couple gradient packs from Blue Moon Fiber Arts in Stitch Pink and grey/blacks that she is going to design a project for. Jill really likes the Leiden top by Natalie Selles from the Pom Pom Quarterly Summer 2018. She bought Tecumseh by Caitlin Hunter. Jill downloaded the Neri cowl by Pariser Landluft, and likes the free tutorial from The Little Bee for the Ropey Rainbow Basket by Alia Bland. Brenda got some cute sheep fabric from Sew Together Stitching Lounge. Jill got the Flower Power Sprout and Shout Quilt kit from Craftsy. The Alienist on TNT, and book by Caleb Carr.